Electrify your nights in the land of the electric blues! 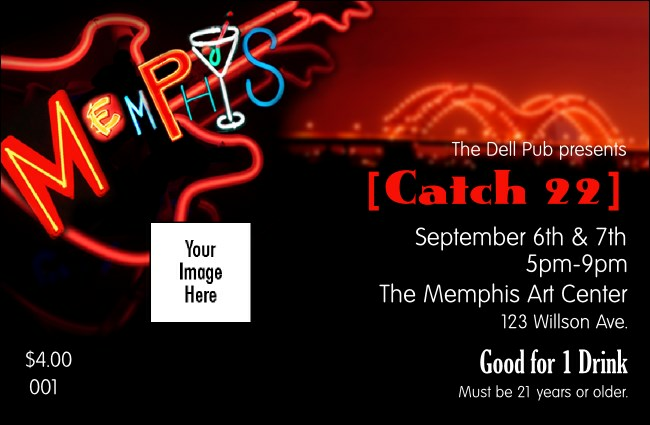 Memphis Drink Ticket, part of our matching Memphis Event Kit, lets you upload your own custom image or logo to a colorful neon ticket that embodies the spirit of the city. Drink tickets help you sell drinks, reward patrons, and make your bartender's job a little bit easier. Ticket measures 4.14" x 2.71"
Across the USA and around the world, TicketPrinting.com has the right tickets for all your events.